O Canada! Did you know that the Heritage Horns sound the first four notes of our national anthem everyday at noon? It’s lunchtime in Vancouver and everyone knows it thanks to the Heritage Horns at Canada Place. A familiar sound for locals, and a novel one for visitors, the Heritage Horns have sounded the first four notes of O Canada every day at noon at Canada Place for the past 20 years. The history of the horns dates back much further. 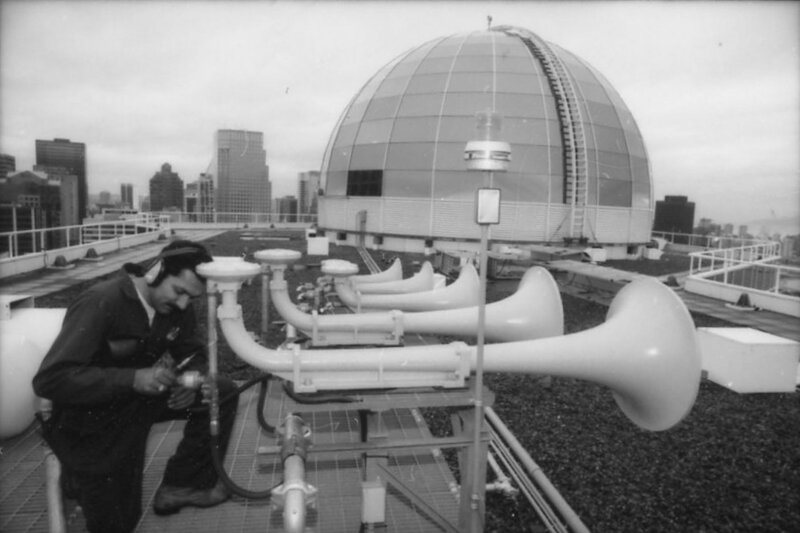 The Heritage Horns, as they are known at Canada Place, were built as a BC Hydro Canadian Centennial project in 1967 and were designed by engineer and sound specialist, Robert Swanson. For many years, they were positioned on the roof of the original BC Hydro Building where they sounded every high noon in the downtown core for more than 20 years. When BC Hydro vacated the building in the 1990s, the horns fell silent. Shortly thereafter, a permanent home was found. Canada Place Corporation acquired and refurbished the horns, and placed them on the roof of the Pan Pacific Hotel at Canada Place. And on November 8th of 1994, the familiar sounding of the horns returned to Vancouver at noon, just in time for lunch! Previously operated on a mechanical timer, the horns would not always chime at exactly noon. Canada Place would field many a phone call from local businesses noting their employees would be leaving too early for lunch, attributed of course to an early miscue by the horns. And so it was decided to switch to an electrical timer to ensure a consistent sounding of the horns at 12 noon – sharp! It takes 10 cast aluminum horns to play the first four notes of the national anthem. The horns blow at 115 decibels and can be heard throughout downtown, on the North Shore, and beyond. The Heritage Horns are a local legacy and a proud part of our Canadian history. The horns use 109 cubic feet of air at 150 PSI (pounds per square inch) for a 6.5 second blast (the first four notes). Listen to the Heritage Horns now!